I was a subscriber to Door-to-Door Organics a few years back (the company has since shut down, though I wonder if they shut down too soon since presumably they could have done something similar given they already had the logistics in place to deliver produce), then we moved and I was no longer in the delivery area. I then started following Imperfect Produce over on Instagram and was convinced of the idea of rescuing “ugly produce,”, but alas they were in the West Coast and were slowly moving their way down that coast and not to the East. I was happy when someone from our Zero Waste New Jersey Facebook group posted about Misfits Market. I quickly read up on the company and checked to see if I was in the delivery area. Thankfully I was so I signed up. Misfits Market is based in Philly and sources from regional farms so the footprint of the fresh food is much shorter for me being in NJ. I was also looking to expand my repertoire of veggies and hoping to get creative with each box I get. This review covers my first 6 boxes each received on a weekly basis from December until now. **If you are looking for a referral link, click here for 25% off your first Misfits Box. Misfits Market is a produce delivery service that strives to rescue “ugly” organic produce from going to the landfill. Did you know that nearly a billion people are either starving or malnourished yet we waste over $1 trillion of food because they are deemed too ugly by our grocery standards? Ugly can mean not up to size, shape or color. Misfits offers 2 sizes: Mischief Box which serves around 1-2 people a week and the Madness Box which serves around 3-4 people. For a household of 2 people who still eat meat, but moving towards a more plant rich diet, the Mischief Box works for us. 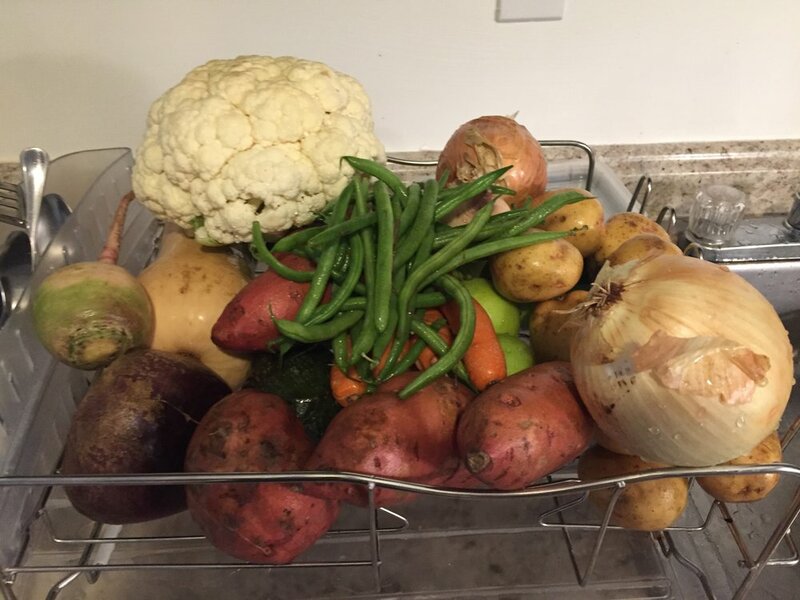 There’s a good amount of variety that comes from each box, although in the beginning I was getting a lot of sweet potatoes and regular potatoes and I had to find clever ways to use it all up. Understandably, because they also source from farms within the season, the abundance of vegetables and fruits of the same variety can vary greatly. I was surprised to see lots of tropical fruits in my boxes though. I’m not mad about it because they actually remind me of my time in the Philippines, but it’s just curious that for a few boxes, we received mangoes, avocados, and star fruits. I like the surprise factor of the box. They do send out a list of the items that could come in the box depending on their sourcing, but it’s never all of it and it’s never the same to it keeps me on my toes and makes for interesting and creative dinners. I’ve received around 6 weeks worth of produce, one a week. For the first initial boxes, half of it was wrapped in BioBags and the rest loose. The box was insulated using a cornstarch based material that dissolves in water. The box is packed pretty well so there’s not a lot of excess space. I’m glad they use BioBags because I can confirm they are compostable (tested here), but I do think some of the fruits/veggies do not need to be in bags. In my last shipment though, I was disappointed to see none of the more “earth-friendly” packaging materials were used. Instead, a lot of the items were wrapped in conventional plastic and then a second layer of large plastic was used for insulation. I’m looking to see how this week’s box goes. Perhaps they now have a new distributor and is getting ramped up with the packaging. As far as packaging, I’ve been saving some of them. I will either place them on Craigslist or my husband will re-use for his work. I’m reluctant to dissolve all of the cornstarch packaging since it can be used a few more times. Managing your box subscriptions is fairly easy to do on their website. You can choose your delivery dates and also opt to skip some weeks. I used the Skip feature for one week as we were abroad and it worked seamlessly. I also changed the delivery date so that a box would be delivered the day we got back ensuring we had fresh vegetables at home. The Mischief Box is around $19 if you do the subscription delivery, while the Madness Box is around $34. So far with shipping, my total weekly expenditure for the Mischief Box is $23.50. You can use this referral link to get 25% of your first box. Subsequently, you can also share your own referral link with friends which gets you more discounts and shares the ugly produce with others. One week’s worth of produce from Misfits Markets. Not pictured: greens. Costs around $24. One week’s worth of produce from Misfits Markets. Not pictured: Brussels sprouts. Costs around $24. Note the mango. Fennel from the Misfits box. Something I would never pick up so I had to find a recipe for it. Green onions from my first box back in December. You learn quickly how to make the vegetable last longer via proper storage. Click on the image for more tips. I think for the cost, it’s worth it. I do still supplement our grocery shopping with some meat buys and other fruits/veggies depending on the recipe and cravings for that week. I have found that even though it’s “ugly,” I haven’t found the produce to be unusable. Some might be too large or too small or shaped weird than what we are used to, but everything has remained edible. The variety has been good for our family of 2. I am looking forward to the spring/summer season when the contents change, but I may also consider pausing the service when the farm markets are back to take full advantage of local produce. For every 5 bags of food, the average American throws away 2 bags. For the month of August, I completed the #reducefoodwaste project over on Instagram inspired by the book "Waste Free Kitchen" by Dana Gunders. It was quite a learning experience and you think you know stuff, you are schooled yet again. Fitting as I am writing this recap in September while many are back to school.